If you want to properly play a round of golf, you need a few things. First, a lot of golf balls you don’t care about hitting into the ponds. Secondly, a set of good golf clubs. And thirdly, a dope golf cart to take you across the course. The latter is the subject of today’s article, as we’re going to present you two of the most beautiful and well-made Hummer golf cart models. The game of golf is notoriously expensive and you can take it up a notch higher with these incredibly customized luxury golf carts. Costs usually range from $10,000 to $20,000, so expect to pay a small fortune for your personalized mini vehicle. Today’s Hummer carts are complete with amazing breaking systems, iPad holsters and limo features, making them shameless showpieces for anyone who wants to show off on the golf course. Here are two of the coolest – and costliest – Hummer carts out there. Are you craving the status and superior performance linked with the Hummer brand? Then any of these two models will be your ideal companion on the green turf. From the rough-looking chassis to the elegant trim, these Hummer golf carts have surpassed most of the luxury electric carts on the market. Not only are they worth your money, but they also offer exquisite features in return. According to the manufacturer, the Hummer H3 series provides users with the most generous seating area and the most spacious legroom of any electric golf cart in the world. ACG Inc. is one of the most appreciated companies in terms of Custom Electric Vehicles. Hummer H3 was one of their best series, revolutionizing the electric vehicle industry. Back in 2005, the increasingly popular golf platform needed a bit of help, so ACG Inc. helped it rise from the ground up. Built with reliability and purpose in mind, the Hummer H3 can transform from a community vehicle to the envy of every player on the golf course in a second. The transformation is based on an easy to use hand-release golf bag attachment. The quality of the Hummer H3 begins with the new parts used for the manufacturing. 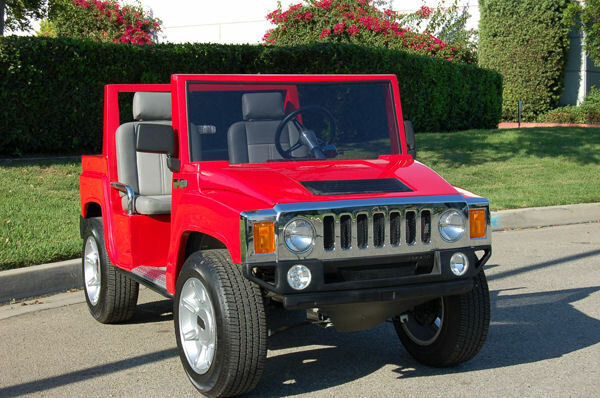 Engineered from the ground up, this Hummer golf cart model uses frames made from corrosion-proof, all-aluminum I-beams. It also features maximum range thanks to a long lasting 48-volt system. The Hi-output 17.5 peak horsepower AC motor is so powerful that it can push the cart uphill with ease. Meanwhile, the engine is also efficient enough to provide a higher range than the average golf cart. Do you want to charge your smartphone between holes? The Hummer H3 comes with an on-board 12-volt converter to provide you with enough in-dash power source. It can also power your laptop computer, if need be. For increased safety, the Hummer H3 standard model is equipped with standard norm-abiding brake lights, headlights, turn signals, and horn. It’s also the only golf cart to employ a standard 4-wheel braking system for added protection. H3 Hummer limo golf carts are the next level of luxury on the course. They’re particularly useful if you and your friends want to ride together. 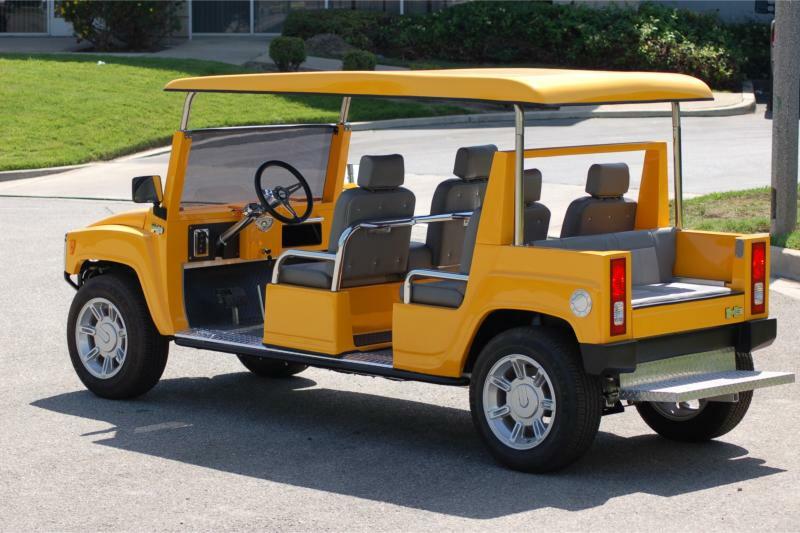 An official licensed GM product, the Hummer limo golf cart comes with a certificate of authenticity from Hummer. Wondering what’s so special about this model? It comes with 15-inch custom built and proportioned Hummer wheels, as well as rugged all-aluminum I-beam chassis for stability. To stay safe as you drive on the course, the Hummer features standard headlights, brake lights, turn signal lights, horn, and reverse warning buzzer. In addition to the standard 4-wheel braking system, the Hummer limo golf cart also comes with a long-range 48-volt system. The center console offers cup holders for your fancy cocktails. Thanks to all of the standard features ACG Inc. has engineered into the Hummer H3, this series has reset the bar in the custom electric vehicle industry, reaching a never-seen-before level. Other companies continue to hope to come close to their luxury standard. For increased customization, the Hummer H3 limo is also available with custom-made paint and graphic schemes. It’s never been easier to add that special personal touch to your vehicle! The Hummer H3 is engineered with all of the quality assurances of an Officially Licensed GM Product. The design allows the golf cart to display the Hummer H3 emblem proudly. With enough legroom and interior space, this custom electric vehicle meets the needs of its passengers. With cup holders in the center console and an ergonomic accessory panel for the easy-to-read battery charge indicator, the Hummer H3 limo should definitely be on your shopping list. 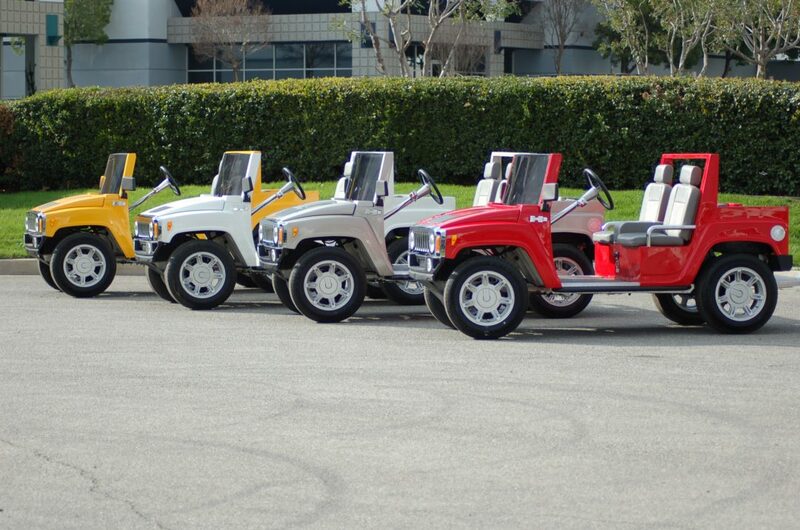 What do you think about the Hummer golf carts presented in this article? Can you imagine yourself behind their steering wheels? Share with us your thoughts in the comment section below! Also, we would love to hear from you if you already have one of the Hummer models above!